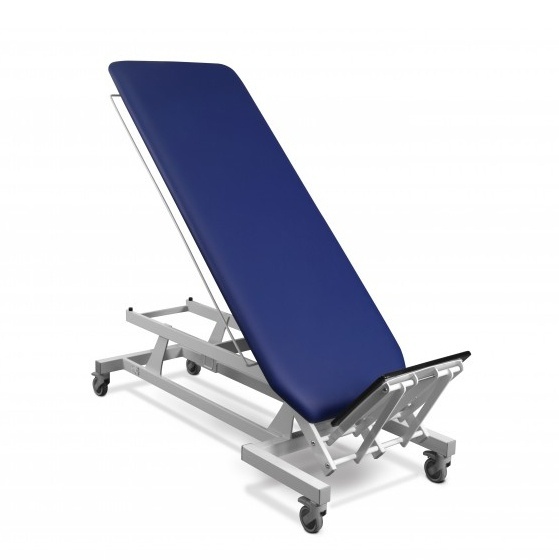 Vertimo are Meden-Inmed’s high-tech verticalisation tables. Classic, Hi-Lo and Cardio Plus (meant for cardiological rehabilitation) are the three available models. Every treatment is safe and effective due to railings and stabilisation belts which are parts of every model. Long-term immobilisation and spine cord injuries are main indications, when treating with this table. It can also help to treat incorrect body posture and infantile diplegia. As far as rehabilitation is concerned, verticalisation has to take place as quickly as possible, since the patient’s organism has to become accustomed to vertical position, circulatory system requires enhancement, whereas body tissues need ventilation. Verticalisation can also be the first step to walking learning/relearning. The tables’ setup is easy and fast thanks to steering angle actuators which also make height adjustment available. Vertimo can be used in various rehabilitation practices and hospital units, as they have been equipped with drive system consisting of 4 wheels which can be individually blocked.